The United States Navy successfully launched a huge communications satellite today (July 19), adding the second piece to a constellation that should provide a big boost to American troops. The Mobile User Objective System-2 (MUOS-2) satellite blasted off from Florida's Cape Canaveral Air Force Station at 9:00 a.m. EDT (1300 GMT) today, riding to geostationay orbit atop a United Launch Alliance Atlas 5 rocket. The 7.5-ton MUOS-2 — the heaviest payload ever lofted by an Atlas 5 — will help relay communications to forces on the ground from its perch 22,236 miles (35,785 kilometers) above the equator. The MUOS network will eventually field a total of five spacecraft, with four core satellites and one orbiting spare. 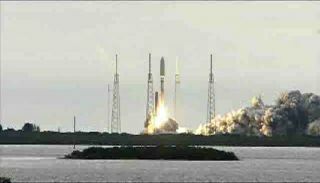 "The MUOS constellation will ultimately replace the current UHF SATCOM system, providing military users with 10 times more communications capacity over existing systems, including simultaneous voice (full-duplex) and data, leveraging 3G mobile communications technology," United Launch Alliance officials wrote in a preview of today's launch. MUOS-1 launched in February 2012. MUOS-3 is tentatively slated to lift off next summer, with MUOS-4 likely following about 12 months after that. Lockheed Martin won a $2.1 billion contract from the Navy to build MUOS-1, MUOS-2 and associated ground control architecture back in September 2004. The Navy later exercised an option to build three more MUOS spacecraft.